In 1991, the duo Moodswings collaborated with the leadsinger of The Pretenders, Chrissie Hynde, and produced one of the most satisfying cover coversion of a Vangelis-penned tune, "State of Independence" (even better than the Donna Summer version). The single did manage to chart in the UK, and then has slipped into obscurity. 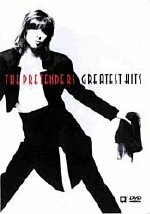 Recently, a compilation video for The Pretenders was released, and oddly enough, this track by Chrissie and Moodswings appeared on it! The DVD provides a great opportunity to get a pristine-looking video of this great track.